"DeStefano’s page-turner of a book with its cliffhanger ending deserves its multiple starred reviews." 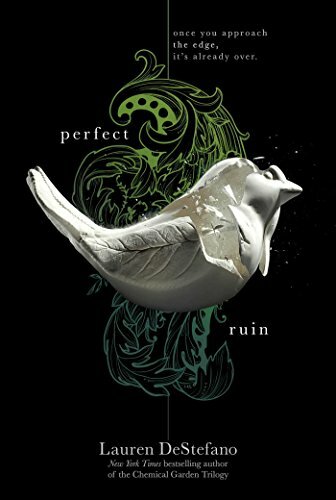 Just when you think you’ve had your fill of YA dystopian fantasies, a book like Lauren DeStefano’s Perfect Ruin comes along and you fall in love with the genre all over again. The history of Internment, a city-state sited on a giant, grassy clod of earth that floats amid the clouds high above the ground, says that the god of the ground found the first humans to be greedy, demanding, and ungrateful. He wished to destroy those first people and start all over again. But the god of the sky stepped in. He agreed to keep the people in the sky with the promise they would never leave. Generations later, the people of Internment view their home not as a prison, but as a utopia. And why not? They are the beloved of the sky god. People are happy (mostly). Life is simple, but predictable: partners assigned at birth; children approved by application to the authorities. Clever engineers have crafted a telescope so the people can see the land below them. Tall buildings. Bridges. A hint of a different life. Occasionally, a crazy person or a very curious one dares to jump off the idyllic city—going over the edge, it’s called. But beyond the train tracks, beyond the fence and the piece of land that lies between the fence and the sky, a force field of monstrous wind surrounds Internment, a wind so powerful that it spits back anyone who jumps. Some are dead. Some are maimed. Some, like Morgan’s brother, are left blind. When a classmate is found murdered the myth of safety dies, and fear overtakes the city at that rare event. But the accused is innocent, as Morgan discovers when she finds him hiding in a park during one of her nighttime rambles. The king says the guilty boy is imprisoned, awaiting trial. What other lies is the government telling? What other truths are kept from the citizens? And Morgan dares tell no one about her own dark thoughts, the curiosity that swirls through her brain about the ground below. Internment seems at first to be a charming fairy-tale of a place with a magical starry sky overhead. Gradually, we begin to feel as suffocated, as claustrophobic as does Morgan and the underground rebels she sides with. It comes as no surprise that Morgan and her best friend, along with her betrothed Basil, join the rebels in an attempt to escape Internment. Nor is the mode of escape unusually innovative. But the story is original, the unique setting as much a character as Morgan is. And the sweet romance between Morgan and Basil—betrothed at birth like everyone on Internment (one presumes to maintain maximum genetic diversity in a closed society)—is appealing. The idea of knowing your intended partner for your entire life and of that partner providing constant love and support has its own appeal. DeStefano’s page-turner of a book with its cliffhanger ending deserves its multiple starred reviews. Characters, plot, setting—all meld together to create a story that’s hard to put down and hard to forget. Even harder? Waiting for the sequel, Burning Kingdoms.